The Puget Sound area isn’t known for its war history, but war has touched the region, and evidence remains in Fort Casey State Park on Whidbey Island. Fort Casey was built in the late 1800s and used for training all the way up until the mid-1940s. Between those time points, it was part of a trio of forts, including Fort Worden and Fort Flagler, designed to defend the entrance to the Puget Sound. Today, Fort Casey State Park showcases the fort’s original defense purposes, but it also makes a stellar place to hike, camp, explore the historic structures and lighthouse, and enjoy some pretty sweet views of the Puget Sound. First and foremost, just explore. Fort Casey State Park is located on the inherently picturesque Whidbey Island, so views of the Puget Sound, Cascades and Olympics are wide open, large stretches of grass are perfect for relaxing or flying a kite, and there’s a stretch of beach where you can stroll and watch for orcas offshore. The Admiralty Head Lighthouse is a highlight for many as well. You can get a guided tour when the lighthouse is open or visit the Interpretive Center (it’s closed during some colder months). You’ll learn not only about the fort and lighthouse and their history, but also about the Native American tribes who lived in the area and their history. Exploring the old fort is interesting even if you don’t have a penchant for military history. You’ll find plenty of plaques explaining the significance of the structures, and during summer months, you can join in on a guided tour to learn more. Even if you simply walk around on your own, the twisting passages and gun batteries are fascinating. Fort Casey is a great outdoorsy destination, too. There are 1.8 miles of trails that are relatively easy and family-friendly. For boaters, you’ll also find two saltwater watercraft launches (permit or Discover Pass + daily launch permit needed), which opens up a chance to fish or otherwise enjoy the water. And stay for the sunset – this is one of the prettiest places to watch the sun dip below the horizon. If you’re looking for a place to go camping that offers more than just a beautiful, natural place to get away from it all, Fort Casey is ideal. Fort Casey State Park has 22 standard campsites, 13 partial-hookup sites with water and electricity, and one shower. Campsites are located next to the Keystone Ferry terminal and reservations are a good idea, especially in the summer. Reserve online or by calling 888-226-7688. From the campground, you can watch the Port Townsend Ferry come and go, and you can also spot plenty of wildlife and birds. Bathrooms are well-kept and clean, which is always a bonus! Navy jets are known to fly over from the Naval Air Station Whidbey and Navy personnel conduct training missions during some days and nights. You might hear nothing during your stay, or you might hear some military activity. If camping is not your thing, Whidbey Island is also home to plenty of other places to stay, mostly in the form of B&Bs and small inns. Closest to Fort Casey State Park are a few such small inns, including The Inn at Penn Cove and Captain Whidbey Inn. The fort was built to defend the entrance to the Puget Sound in the late 1800s and was in use until the mid-1940s as a training facility. In fact, soldiers were stationed at the fort from 1899 all the way until 1945, so as you’re visiting, imagine the historic structures teaming with activity—training exercises, soldiers at their stations, manning the disappearing guns that were the height of technology at the time. While the fort was technologically advanced when it was built, it didn’t take long for technology to advance further. The 10-inch disappearing guns, observation stations, communications systems, and plotting rooms were the height of innovation in the late 1800s, but by the 1920s, warships and airplanes made locations like Fort Casey outdated. Fort Casey remained in use throughout World War II, but after the war, it was decommissioned. In 1955, Washington State Parks acquired the fort. 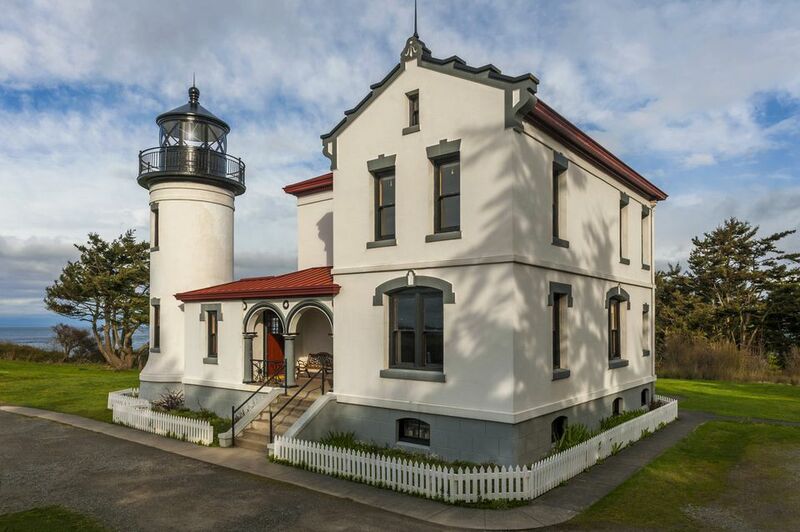 The original lighthouse, perched 127 feet above where the Puget Sound and Strait of Juan de Fuca meet, was built in 1859. But not long after the first lighthouse went up, builders decided it wasn’t enough. The lighthouse also stood right in the path of a new firing battery. The current Admiralty Head Lighthouse that stands today was built in 1903. It’s two stories tall and constructed in Italiate Revival style. By 1922, the lighthouse was out of use as other nearby lighthouses at Point Wilson and Marrowstone Point were more useful. From Highway 20 on Whidbey Island, go south on Engle Road at Coupeville for about 3.25 miles. Or go six miles south of Coupeville, and when the road changes from Highway 20 to SR-525, follow Highway 20 west for 3.5 miles. Fort Casey is a state park, so you will need a Discover Pass to visit. The cost is $10 for a single day or $30 for a year. If you don’t already have a pass, you can buy one here at an automated pay station. Sure, you can visit Fort Casey State Park on its own, but it makes a great feature on a wider Whidbey Island itinerary, too. Visit the park one day, and then enjoy Whidbey Island’s idyllic natural scenery. Hiking abounds at other state parks or natural areas, like Ebey’s Reserve. Fishing, boating, or whale watching (from land or by boat) are popular since shoreline is so plentiful. Or if you want a break from all the nature, visit Oak Harbor, and venture into local shops, galleries (Whidbey Island is popular with artists), and restaurants. If you want to get out on the water, but don’t have a boat, you can also hop onto one of the ferries that leaves from Whidbey Island and explore farther afoot. There are two ferry routes that leave from Whidbey Island: From Clinton to Mukilteo on the mainland and from Coupeville to Port Townsend if you want to explore the Olympic Peninsula.